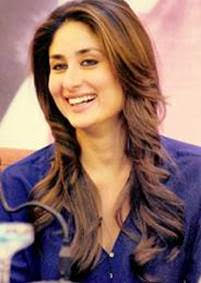 The fact that she is one of Bollywood’s most beautiful stars isn’t the only reason why all eyes are on Kareena Kapoor, as her latest hairstyle in new film Ki and Ka is taking Bollywood by storm. Women and hairstylists alike ogle after Kareena’s beautiful brown locks, but you don’t need to be a red-carpet regular to look like a star! Prior to the release of Ki and Ka, in which Kareena’s hair steals the show, hairstylist to the stars Asgar Saboo, who has worked with some of Bollywood and Hollywood’s finest, including Aishwarya Rai-Bachchan, Deepika Padukone, Cindy Crawford and Eva Longoria, shows you how to recreate Kareena’s signature look to unveil your inner superstar. Spray your clean, wet hair with volumizing spray, or work in another volume-enhancing product. Pull a large barrel brush through your hair, aiming the blow-dryer down the hair shafts until the hair is completely dry. Lift the roots whilst drying to give body. Separate out a section of hair that runs from temple to temple and is positioned at your hairline or behind your bangs, depending upon your hair style. Comb any tangles out of the section, and spray the hair with a heat-protectant spray. Take a 1-inch-deep section of hair from the section that has been sprayed. Place the open curling iron at the end of the section and clamp the curling iron down over the hair. Turn the curling iron back towards the crown until the iron reaches the scalp. Hold for five seconds, then release. Wrap the resulting warm curl around your fingers and pin it into place with bobby pins. Repeat throughout the rest of the sprayed hair until the entire section has been curled and pinned. Curl the remaining hair away from your face. Pin each curl into place as you go for long-lasting curls. Once all of your curls have cooled, remove the pins. Brush through your curls with your fingers, shaking your head upside down for additional volume. 16 queries in 0.556 seconds.